Hello. I know that geishas and other performers dyed their teeth black sometime before the meiji period but that is all I know. I would like more information! Could any of you help me? It would be greatly appreciated. I am so curious about this! Thank you. P.S. I am waiting to become active. My username will be lolachan. Please look for me later on! It's not just performers that did it, it used to be as common as wearing lipstick is today.. I'm not quite sure why though. I know of an old Shinto idea that bone was considered to be impure.. teeth as a form of bone may have been considered better hidden. I suppose it could have been something to do with gleaming white teeth looking predatory, or even just that many of the high court had rotten teeth and the rest of the population thought it was a fashion... :? Tooth blackening, aka haguro, has been around since at least Heian times. Depending on the era, both men and women engaged in this. There were various reasons for doing it, some of which were given above, and one I've read about was that it gave a comely appearance to one's mouth. 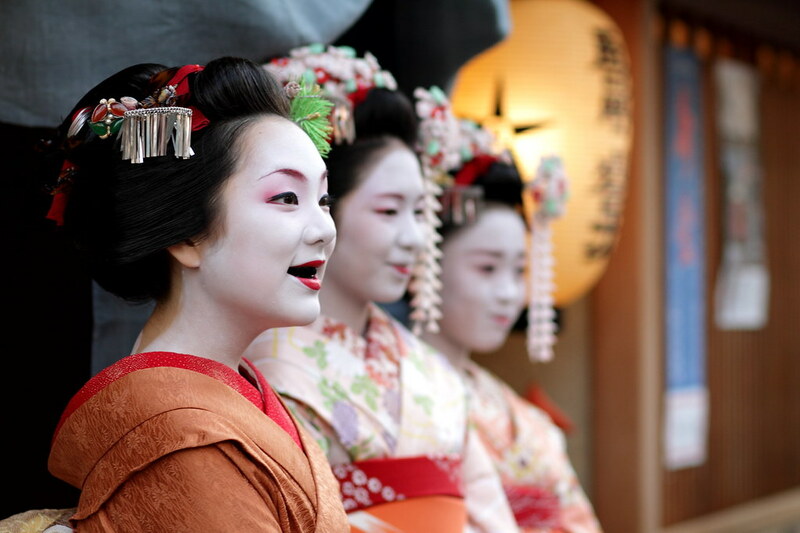 "Ohaguro are the teeth dyed in black, which was the custom practiced in olden times, mainly by women. The black dye is an oxidized mixture of iron shavings melted in vinegar and powdered gallnuts. Around the ninth century, tooth blackening came into fashion among Heian court ladies and some men. In the Muromachi period (1336-1568), it became popular even among commoners and was done from the age of puberty. In the Edo period (1603-1868), married women were required to dye their teeth black. This custom is no longer practiced." I don't have the URLs, but I'm sure I could re-find the sites again. Let me think over this a while. I do recall that blackening teeth was somewhat "in" in Kyoto at the court during and before the sengoku jidai. I also recall it spreading a bit into the most high class samurai families as a sign of, well, I think today the extremly young users of the net would call it "l33t". I'm not 100% sure now, but I think it was the Tokugawas who were not that fond of it, mainly because it had a somewhat decadent touch to them. Overall it was mainly a sign of the high class women -not to forget the flower and willow world here- during the Edo period (I'm thinking of families like the Tokugawa, the Yagyu, maybe even the Fujiwara, and -before Tokugawa roughed them up- Toyotomi; etc etc). I doubt that you'd have seen the common peasant woman (or even the wives of low ranking samurai with only a few koku as fief) blackening her teeth, or even shaving her eyebrows. I think it's one of those things only people who never really worked could have come up with. At the court in Kyoto you had time for such things, in Edo or even Osaka it was already a bit different, not to mention the even smaller towns and villages. Personally I'm not too fond of it either, I don't know, I prefer the natural colour of their teeth. 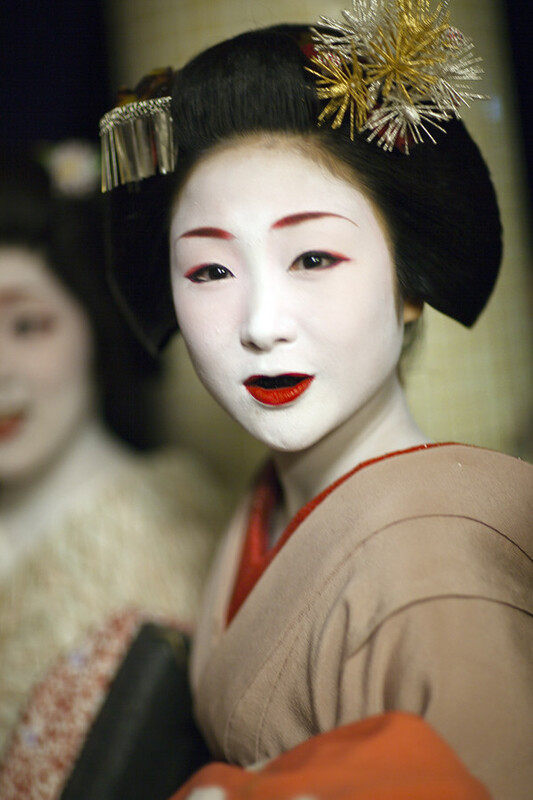 Though, combined with the white geiko-makeup is has a certain something. Interestingly, when watching a classic jidai geki you do see the shaven eyebrows (just take any of Kurosawa's last works like Ran or Kagemusha, etc), but I've so far never seen the blackened teeth in those; though that's not entirely correct, I've seen it once by now, in Shogun, but there it was a court official who had it. I've thought about this a bit as I wear Japanese clothing as part of my persona portrayal in the Society for Creative Anachronism. The SCA is primarily geared to the re-creation of pre 17th century Western European culture, however, non-Western personae are not excluded and are considered "guests" in a foreign country. As such, when I am being Saionji, I am an emissary of my culture. In order to honor my Emperor, my family and my people, I am obligated to present myself and my culture in the best light possible as I sojourn among strangers. As an American of northern European descent, I am obligated to portray a Japanese with respect, not with stereotyped caricature. 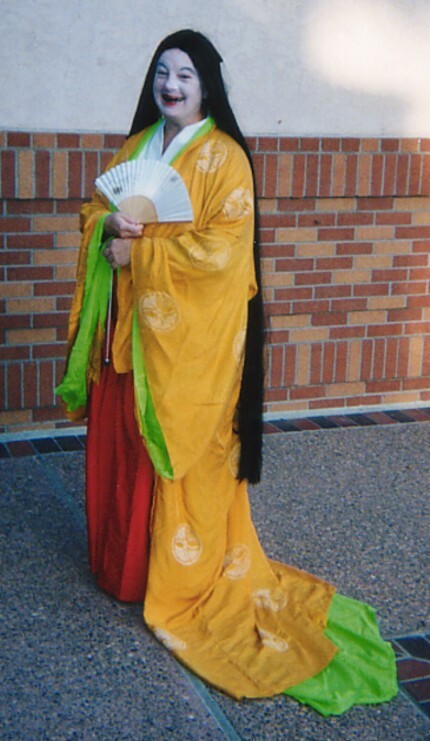 As a modern person trying to portray a either 13th century English gentlewoman (my other persona) or Japanese courtier, I am obligated to do honor to our forebears. If one wants to portray a Japanese of a certain time period and social rank, black teeth are part of the package. It's messy, it's time consuming, it tastes lousy, and since I have to show up to work on Monday looking like a civilized 21st century Caucasian, I can't resort to something as permanent as what was actually used, so it ALSO requires touch ups if I eat. Some people do find it a bit disconcerting at first, but for me, it's just part of "being Saionji." Wow! that black grin is awesome. I dunno who thought of black teeth first, but it ties in with powdering the face. A long time ago, both male and female japanese of rank would powder their faces, and both would blacken their teeth. ( I think!) but then men stopped powdering their faces at some point, and stopped blackening their teeth. I think maybe it's because the white makeup throws the yellow teeth into prominence --- and they do look yellow against such white skin. But then again --- they might not have had a problem with normal coloured teeth, and then it was mostly married women who blacked. 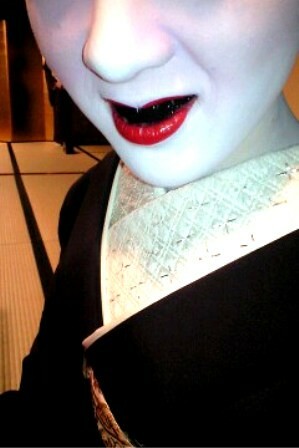 Maiko only paint their teeth black before erikae. They can do it durring all of sakko period or for a period of time as they please. It's only before erikae before they become geiko and not any other time :) At least, I have not seen it mentioned elsewhere. Maiko also don't use 'real' ohaguro in the sense that it's iron filings that have been distilled in vinegar (or something else acidic) which would last about three days, but a paste that comes off when the mouth is rinsed. A lot of them actually complain about how easily the paste comes off, because it means that if they choose to do the ohaguro, they can't eat anything while its on. Komomo complained how she couldn't even eat the special dinner made for her in honor of her upcoming erikae. And I've also seen a couple of pictures of maiko (but I forgot where) who were either early in the process or didn't do it quite right, who had white showing between each blackened tooth. That looked really strange. Komomo-san's looked good. Japanese ladies - at least in the past - didn't tend to show their teeth when laughing or smiling anyway. You'll still see people cover their mouths when laughing or smiling, and I do it often myself when I'm around Japanese people. I think I heard that since the teeth were considered extensions of the skull, they were also considered quite unattractive. I'm not sure that's a valid statement, but it's one possible explanation. Maiko who did it are Mamechiho, Konomi, Wakana, Fukuhina, Fukuya (maybe,) Ichimame, Ichiteru, Katsuru & Sayaka. I think it looks really interesting, like Fuyou said, it's really alluring. White, red, black, love it. Sorry for reviving this topic, but I was reading Superstition in the flower & willow world? and went on by the link to this thread. Last week I took part in very interesting talk series in London: Beneath the Surface: The Culture of Cosmetics in Japan by Noriyo Tsuda, Chief Curator of POLA Research Institute of Beauty and Culture. For ohaguro we've been told that it was a custom of a married woman as opposed to unmarried girl. It supposed to show faithfulness to the husband and as for practical use it did prevent the cavities. Sensei Tsuda mentioned an example of an old woman that was still practising ohaguro in the seventies and till her death she didn't have any cavities. Of course it had to do with fashion as well and it started to fell out of practise after Japan opened to the Western world as it was seen as disturbing and shocking by Europeans of the 19th century.